I graduated from The Citadel May 13th, 1989, and, that same day, received a commission as an Ensign in the United States Navy. After enduring 4 years of military college, I left Charleston, South Carolina with a diploma in one hand and The Citadel Ring on the other. Those 4 years shaped my life. It was not always pretty or fun, but no matter what, I will always have a special bond with The Citadel and those who have attended it. While serving in the Navy, I did not run into many other Citadel graduates. I had chosen assignments at small units and in remote locations so the number of officers as well as Americans with whom I came into contact was usually very limited. After resigning my commission, I moved to Europe permanently in 1996, taking myself farther away from Charleston. In fact, if I think about it, fellow Citadel alumni sightings were nonexistent for almost two decades. But like most people just out of school, starting a family, and building a career, I focused on the present and the future and did not reflect much on the past. In 2002, my wife took a job in Limburg, the southern most province of The Netherlands, and during our search for a home there, we drove through a small village called Margraten several times before I happened upon a small sign pointing the way to the “American Cemetery”. It took several more trips to the area before we actually drove past the cemetery itself. We did not stop though. 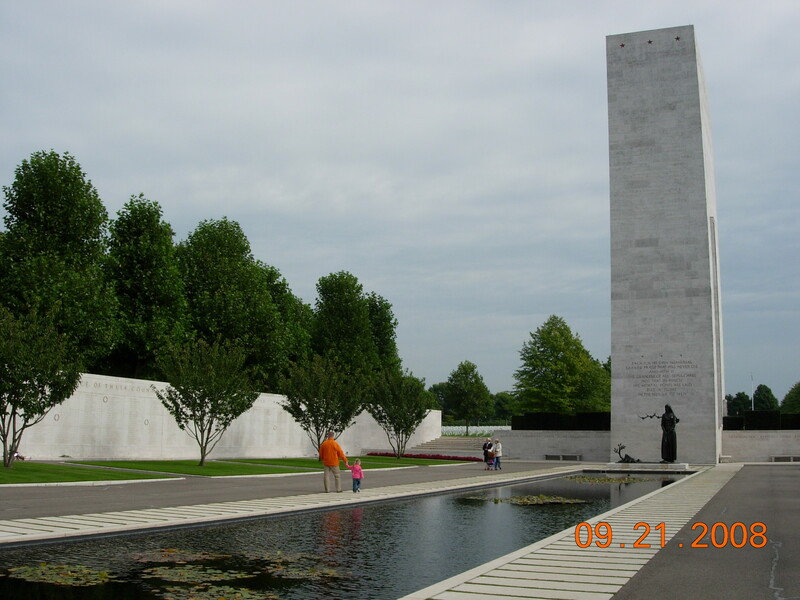 Carillon tower and reflecting pool at Netherlands American Cemetery in Margraten. We found a house an hour’s drive north of Margraten, and it was not until 2008 that I finally visited the Netherlands American Cemetery. That day, the sun shined through breaks in the fluffy white clouds and accentuated all the colors around us. My family was with me, and I tightly held my 3-year-old daughter’s hand as we walked the perfectly kept and manicured grounds. The marble radiated. The 8,301 grave markers overwhelmed me. I had not expected to see so many or find the sight so staggering. All those men made the ultimate sacrifice fighting for their country and for the liberation of The Netherlands which I now call home. It was an emotional experience. So beautiful and peaceful. In a word – serene. Later that day, I remember thinking to myself, “There must be Citadel Men in Margraten.” I immediately became uncomfortable because I did not know, and, worse, because I had not visited their graves if there were. As we get older, have children, and begin to gray, we start to contemplate our own mortality. For me, it was also my 20th class reunion that shook me a bit. Unfortunately, I was not able to attend, but I did have contact with classmates with whom I had not spoken since graduation. I started reflecting more on the past and decided to find out if there were Citadel Men at Margraten. I began my research in the Spring of 2010 when I contacted the curator of the school’s archive and museum, Ms. Jane Yates. In August that year, I finally returned to Margraten so I could pay my respects to the 8 Citadel Men resting there. I then drove 20 kilometers south to the American Cemetery at Henri-Chapelle, Belgium to pay my respects to the 5 Citadel Men resting there. Since then I have also visited the Citadel Men resting or remembered at the Ardennes, Luxembourg, Lorraine, and Epinal American Cemeteries. I look forward to visiting them again, and to visiting for the first time the Citadel Men resting or remembered at another 7 American Cemeteries here in Europe and in North Africa. As Citadel Men, we share a special bond. “Duty. Honor. Country.” We lived and breathed it as young men in Charleston, South Carolina. These men gave their lives for it. I now try to collect their stories and share them here – In Memoriam – so that we shall never forget them.